This article addresses the problem that depending on the configuration, the restore media of version 1803 may not be able to find restore points of previous versions such as the 1511. And therefore can not put those recovery points back. Even though they are present. With the recovery media of 1511 you can restore the recovery points of 1511 and all the higher versions. For computer repairers (and users) this is extremely important information, because it means that without this knowledge, and acting in accordance with it, many computers needlessly get a fresh install and many (paid) programs need to be reinstalled unnecessarily. Whether due to the lack of license keys, or because of the unavailability, can no longer be used. Upgrade fine, (also not really) but then the old version still has to work properly and (often) space on the C are made ahead of the Windows old file. So first restore if it doesn't work anymore with those 1511 recovery media and then upgrade. Startup media, USB and DVD 1803 do not find restore points on older versions such as 1511. Start the PC. And if you see anything from Windows, turn off the power. Then you restart it and then you have to see a black screen with the text: repair. If not, turn off the power again and restart. After a number of times the reprimand has to come and let it continue. You'll see the word diagnostics passing by and then a blue screen with restart and advanced. Click on advanced. Click on system restore and follow the instructions. If there are no restore points, it becomes difficult. In general there is no image or other possibility because many people lack that knowledge. Then all the programs still work. If that does not work, there is nothing else to do but opt for a fresh install with the preservation of the files. However, all programs such as Office etc. must then be reinstalled. The DVD must be the same version as the one on the PC. Home, Pro 32 or 64 bits. Because you can only restore an existing restore point if you use the Home of Pro DVD of the existing installation. If your system restore can start and it is indicated that there are no restore points, then you either have the wrong DVD or there are no restore points. Downloading and burning the iso for all versions is not an option as it is 6.4 gb. You need the media creation tool. If the machine you are using is 32 bits, you need to use the 32 bit creation tool and you have 64 bits, the 64 bit creation tool. This only has to do with starting up the tool because the result is ultimately the same. If you download that creation tool, you will automatically get the right version. Uncheck to select another version. 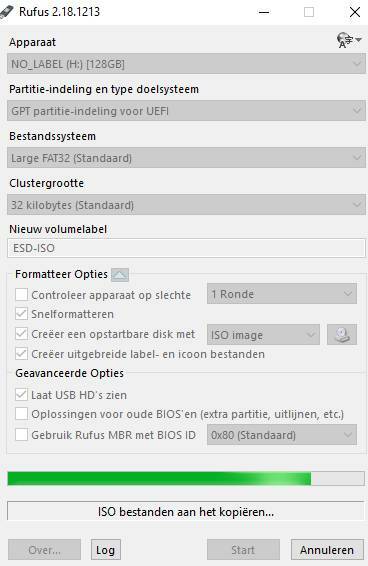 You can choose to make that startup USB, but you can also save that Iso so that you can use Rufus to create another (different) bootable USB stick. If you start a PC with that USB flash drive, you can choose between 32 or 64 bits. You have to choose a clean install. You see Yes and No. Choose No. No restore point? Then try the 32 bits. Nothing yet? Then restore point is disabled or you are dealing with a version older than 1803. It turned out that with that 1803 startup USB stick you can't find restore points on computers with previous versions while those restore points are there. Using the latest version to restore the previous versions will not work. But an older version for a newer one will work. You can use a 1511 DVD for an 1803 version. Then it would be better to use the old 1511 tool, as long as it still works. So it seems advisable to burn only those 4 old 1511 DVDs because that always works (so far). The problem remains that you have to try them all out to see if there is a restore point present, if you don't know if it is 32 or 64 bits, Home of Pro. You can therefore choose to bring in those separate Iso's and store those 4 DVD's. Then you can burn those DVDs and/or create 4 bootable USB sticks with Rufus. You can generally assume that most laptops have the Home 64-bit version.